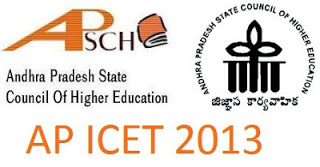 Andhra Pradesh State Council for Higher Education (APSCHE) has released the official notification of ICET (Integrated Common Entrance Test) Entrance Exam 2013 (ICET-2013) for the admission into M.B.A and M.C.A courses (Full time/Part time/evening/distance mode) in all the State Universities in Andhra Pradesh and its affiliated colleges for the academic session 2013-14 which will be conducted by Kakatiya University, Vidyaranyapuri, Warangal (A.P), being conducted on behalf of Andhra Pradesh State Council for Higher Education APSCHE, Hyderabad. The candidate should be Indian nationals and must satisfy all the local/non-local standards under Andhra Pradesh Educational Institutions. Candidates other than Indian nationals must satisfy the standards and rules of concerned universities. Candidates should have passed recognized Bachelors Degree Examination of minimum three years duration with at least 50% marks (45% marks in case of reserved categories) in the qualifying examination. qualifying examination with Mathematics at 10+2 level. committee of UGC, AICTE and DEC. There is no any mode other than online apply. So candidates who want to submit their application for ICET 2013 Entrance Exam for the admission into M.B.A and M.C.A courses in the state of Andhra Pradesh can submit it online using the following direct submission link by filling appropriate details. The application fees/late fees (if any), may be paid at AP Online Centers, Mee Seva/ e – Seva Centers in A.P. or can use online payment gateways via credit card/debit card. Time- 10.00 AM to 12.30 PM.